Tofu, rice noodles & veggies. The perfect combo! 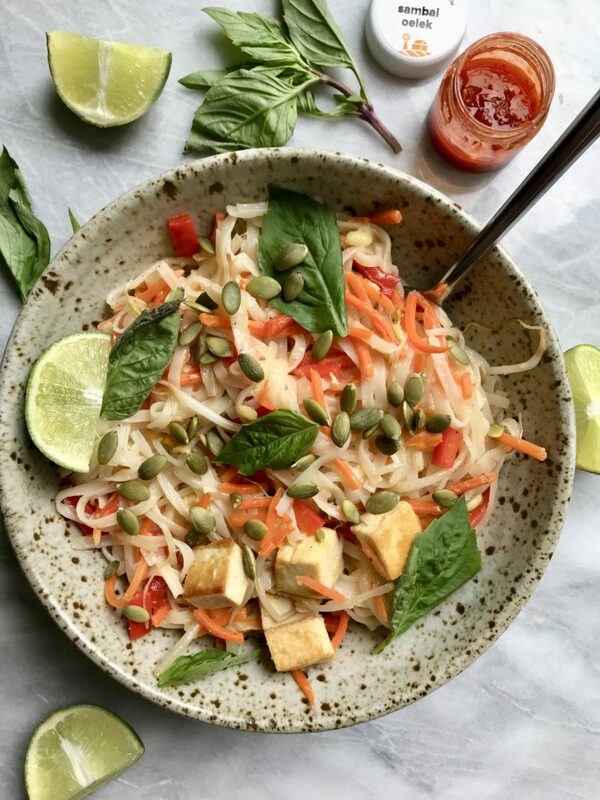 Make this speedy stir fry for your family & friends and wow them with the simplicity of this dish but the array of flavors. You can also make this nut free by subbing the cashews for pumpkin seeds! Made in collaboration with Sunbasket. As someone who loves noodles and stir fry, I knew that this was a recipe I needed to share from one of the Sunbasket’s I received this month. It is seriously so easy to make but tastes absolutely amazing. If you aren’t familiar with Sunbasket, It’s a weekly meal delivery service that offers all organic produce. You get 3 meals a week (big enough for 2 or 4 people). 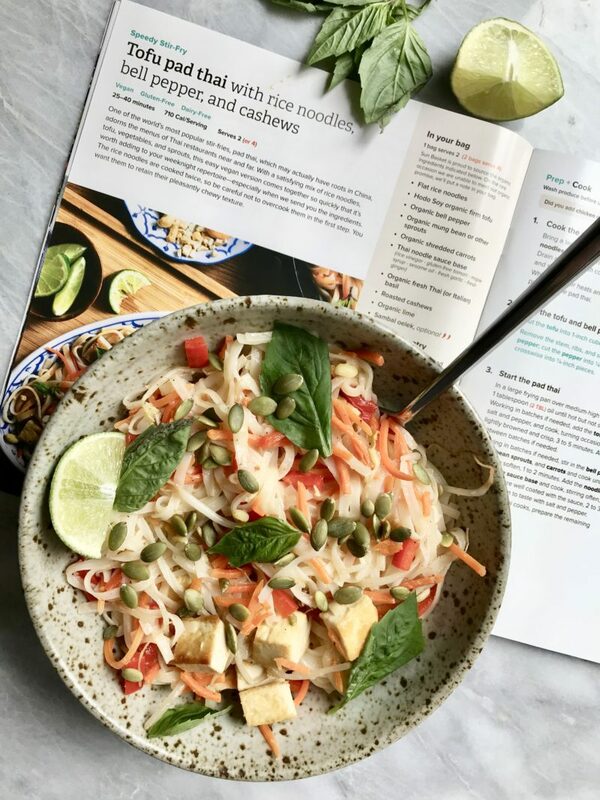 This year they recently added a Vegan menu meaning that you can get all Vegan recipes that are created by nutritionists that do not lack on the creativity for these meals. All of the produce featured in Sunbasket’s recipes are Organic and from the U.S. They develop recipes around what produce is in season. Now that Summer is gearing up, they will focus their recipes on what produce is at it’s peak. I love Summer produce so this is something I am looking forward to! Also, all their recipes which include tofu (like this one) are made from organic and non-GMO soybeans. All their Vegan meals have at the least 15g or protein and 5g of fiber per serving. Who said Vegans don’t get enough protein? This is also great for those who work, or have a busy lifestyle. All the food comes in recyclable and biodegradable packaging. Everything comes packaged individually, so if you do happen to have a nut allergy you don’t have to worry that they’re touching your other ingredients. All these meals are delivered straight to your door ready for you to whip up and enjoy. Begin by prepping your noodles. Bring a large pot of water to a boil. Add rice noodles and cook until tender (5-7 minutes). Drain and rinse with cold water. Return to your pot and st aside. As your noodles are cooking, cut your tofu into one inch cubes. Remove the stems, ribs and seeds from your bell pepper. Cut the pepper into small strips then cut then crosswise. This will make them into small cubes. In a large frying pan over medium-high heat, warm 1 tablespoon oil until hot. Add in your tofu & season with salt and pepper. Turn occasionally. Once they are browned and crispy (3-5 minutes). Once your tofu is browned, add in your bell pepper, sprouts and carrots. Cook until the vegetables start to soften (1-2 minutes). Add in your cooked noodles and stir fry sauce and cook until the noodles are coated in the sauce. Season with additional salt and pepper. 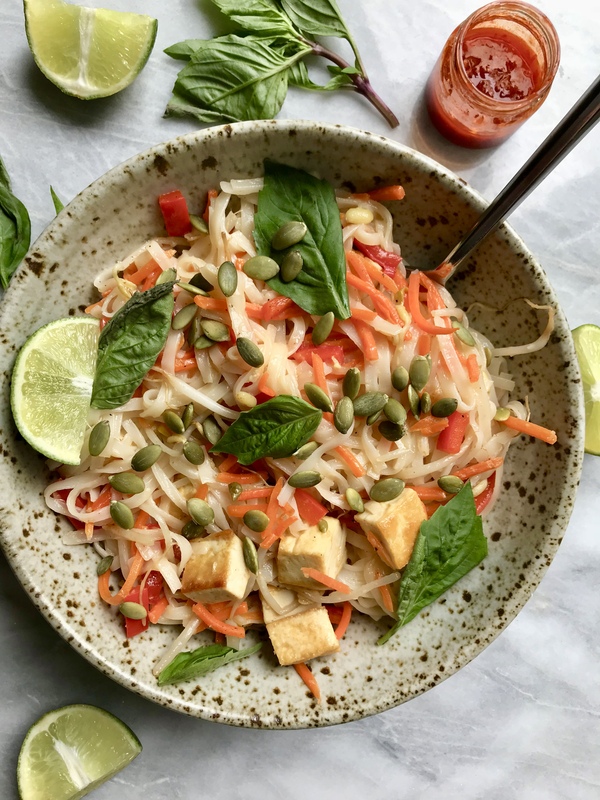 Transfer your noodles to a plate and add your thai basil leaves and lime wedges for garnishing. Crush your cashews (leave pumpkin seeds whole) and add them on top. Serve with the sambal oelek on the side! Thank you to Sunbasket for sponsoring this post. It means a lot to me to work with brands I love and support my blog. Previous Post Cauliflower Steaks with Pearled Couscous Salad & Tahini Dressing.